On Sunday 25 November 2018, three Ukrainian ships - the Berdyansk and Nikopol gunboats and the Yany Kapu tugboat - crossed into Russian territorial waters in the Kerch Strait and were detained by Russia. The incident marked a significant escalation of tensions and the first time since Russia's unrecognized annexation of Crimea four years ago that Moscow has publicly acknowledged opening fire on Ukrainian forces. Thus began a dramatic political escalation between the two countries, including Ukraine declaring martial law. Ukrainian President Petro Poroshenko has called Russian actions "unprovoked and crazy" and called on his allies to provide military assistance to "deter the aggressor". Three Ukrainian vessels were captured on November 25 by Russian forces at sea near the Kerch Strait, which is the only outlet to the Sea of Azov and controls access to two major Ukrainian ports. The two Ukrainian artillery boats and a tugboat were heading from Odesa on the Black Sea to Mariupol on the Sea of Azov. Twenty-four sailors were detained and "courts" in Russian-occupied Crimea ruled that they be detained for two months, pending trial. "This is certainly a provocation organized by the current government, I think, including the current president, on the eve of presidential elections in Ukraine in March next year. The current president is about fifth in [presidential] ratings, and there is a chance he won't make it to the second round, so he needs to do something to aggravate the situation and create insurmountable obstacles for his competitors, first of all, from the opposition," Putin said at the 10th annual VTB Capital " Russia Calling!" Investment Forum. "There are clear signs of a provocation prepared in advance in order to use this as a pretext to introduce martial law in the country. This has nothing to do with any attempts to improve the Russian-Ukrainian relationship. This is an attempt to raise stakes." The Ukrainian and Russian versions of events differ, with each blaming the other for instigating the incident. Russian officials said the Ukrainian ships were maneuvering dangerously, requiring the strait to be temporarily closed for security reasons. 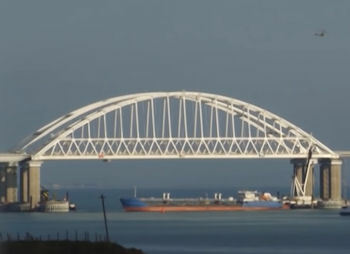 Moscow later announced the reopening of the strait after using a cargo ship to block passage beneath a new bridge connecting Russia with occupied Crimea. The block ship may be one give-away as to which side initiated the incident, since the block ship was either amazing improvization, or something that had been prepared in advance. Another indication was the remarkably comprehensive coverage on Russia's Sputnik outlet. Russian state media gave generous coverage to the incident, devoting several live TV debates to the issue. 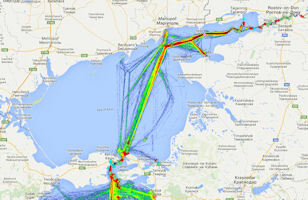 A further incident on Monday 26 November 2018 saw two Ukrainian vessels steaming "at full speed" from the port city of Berdyansk in the Sea of Azov towards the Kerch Strait, prompting Russia to deploy its own naval vessels as well as Sukhoi Su-25 ground attack aircraft to patrol the area of the Crimean Bridge, about 100 miles south of Berdyansk. 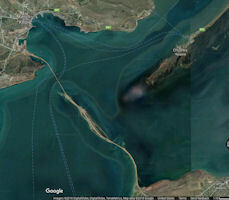 The Kerch Bridge spans the 8.5-mile-wide gap between Crimea's eastern-most point and mainland Russia's Krasnodar Krai. The road portion of that bridge opened in May 2018. 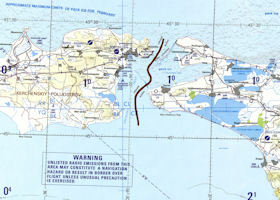 Ukrainian commercial vessels have the right to pass through the strait to reach the important port of Mariupol', which the 2003 bilateral treaty between Russia and Ukraine delineates, albeit according to specific protocols to ensure safety as well as that the interests of both countries are protected. Through the strait also lies the Russian port city of Rostov-on-Don, only 100 miles east of Mariupol'. 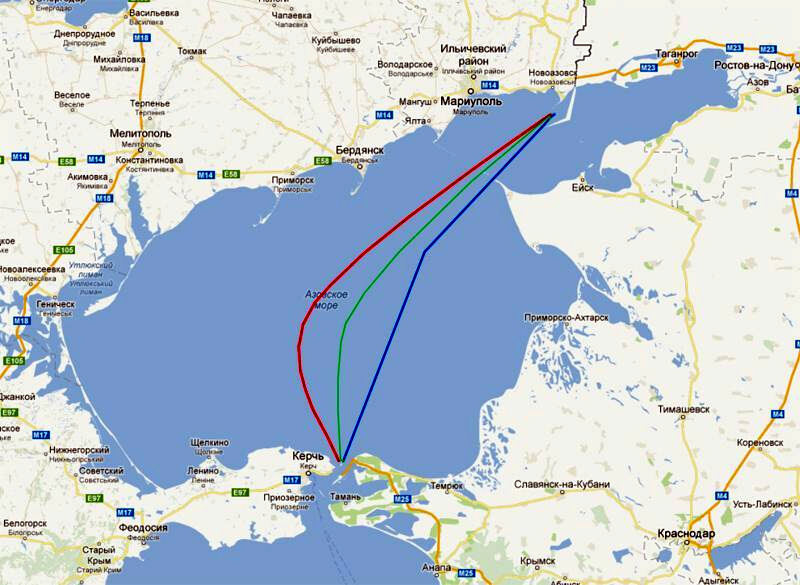 Under a maritime protocol, all ships passing through the busy, narrow Kerch Strait should send notifications and report their route. 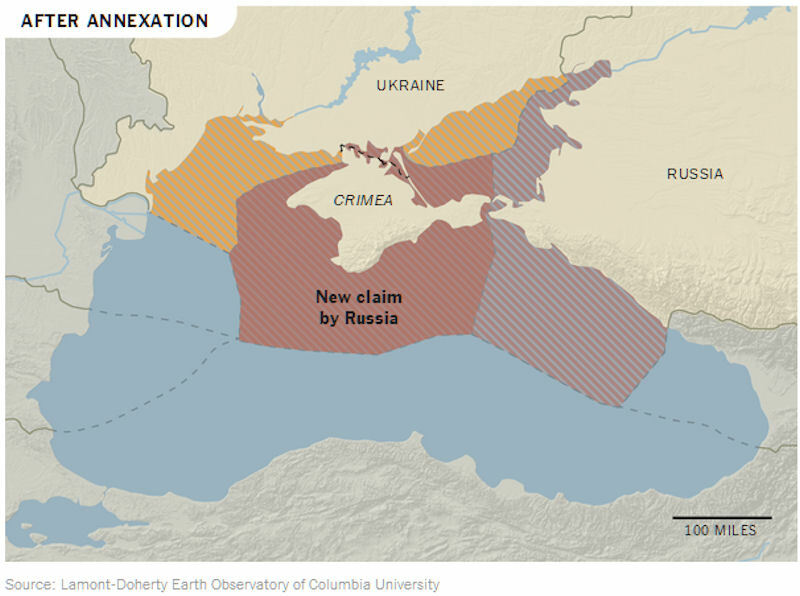 While Kiev says it notified Russian authorities in advance that its navy ships would be sailing through the area, Moscow denies that it was given warning. Ukrainian President Petro Poroshenko said that an act of Russian aggression against Ukrainian ships in the Kerch Strait was aimed at depriving Ukraine of autocephaly and blocking international support. "Why has Putin done this right now? Not to let [Ukraine] have the tomos [an official document on the Ukrainian-based church's independence], to make the church think that if there's martial law, then His Holiness will not give us anything. He's miscalculated. We'll be praying, and everything will be fine," Poroshenko said 28 November 2018. "And the second reason is to deprive us of international assistance. Supposedly, a country that is at war will not get financing. Yesterday I conducted intensive international consultations and stated it is not us who are at war. We are doing our duty to protect our native land. And we heard the answer: 'Mr. President, we believe you,'" Poroshenko said. The east of Ukraine and especially Donetsk and Mykolayiv region depend on the ports of Mariupol and Berdyansk, it means there will be economic damage to these cities and to these regions. It means that the populations will be unhappy with that, demand some action from the government in Kyiv. In a mid-July 2013 incident with Ukrainian fishermen and Russian border guards, only one fisherman survived after a collision between his boat and a Russian border patrol vessel. The incident claimed the life of four out of five Ukrainians who were on a boat in the Sea of Azov From 2015 onwards it was reported that Russia, which now controls both banks of Kerch Strait, made Ukrainian vessels subject to an authorization requirement for passage through the Kerch Strait. 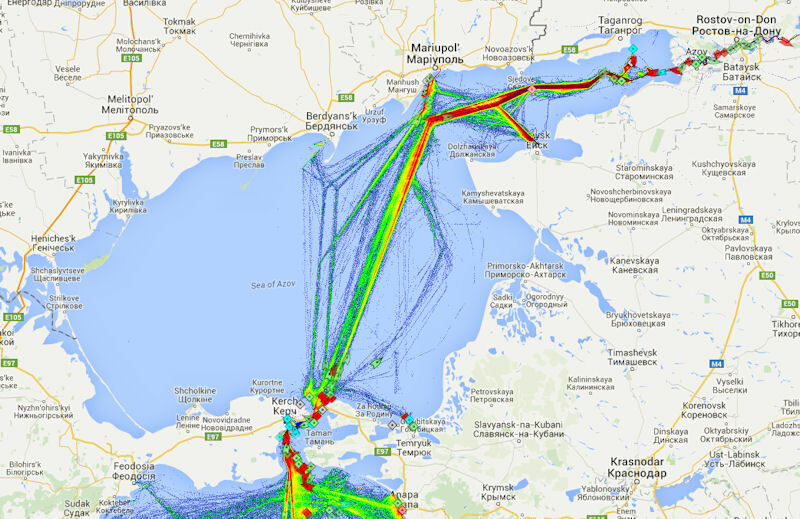 The situation escalated further after the adoption of an Order of the Russian Ministry of Transport of 7 July 2017 which enables the competent Russian authorities to deny any vessels except Russian warships access to the Sea of Azov during certain specified time spans. 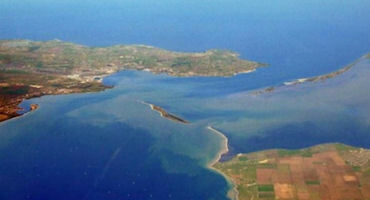 The United Kingdom called on Russia to stop denying Ukrainian and international ships access to the Sea of Azov, the UK Foreign Office said in a statement, released on 20 November 2018, following a EU Foreign Affairs Council meeting. "Russia’s continued disruption of ships attempting to access Ukrainian ports in the Sea of Azov is destabilising the regional economy. Restrictions on freedom of passage have been accompanied by an increase in Russia’s military presence in the sea," the statement read. According to the UK, Russia disrupts Ukrainian and international shipping in the Sea of Azov via conducting stop and search operations for cargo ships arriving at and leaving from Ukrainian ports in the sea. 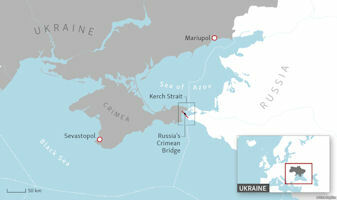 "This is causing delays, significant increases in shipping costs, and a reduction in income to Ukraine’s ports. So far, more than 200 vessels have been affected, in a policy which is damaging Ukraine’s economy and undermining its sovereignty," a spokesperson of the office said, as quoted in the statement. The statement said that so far, more than 200 vessels had been affected and that the policy is damaging Ukraine's economy and undermining its sovereignty. 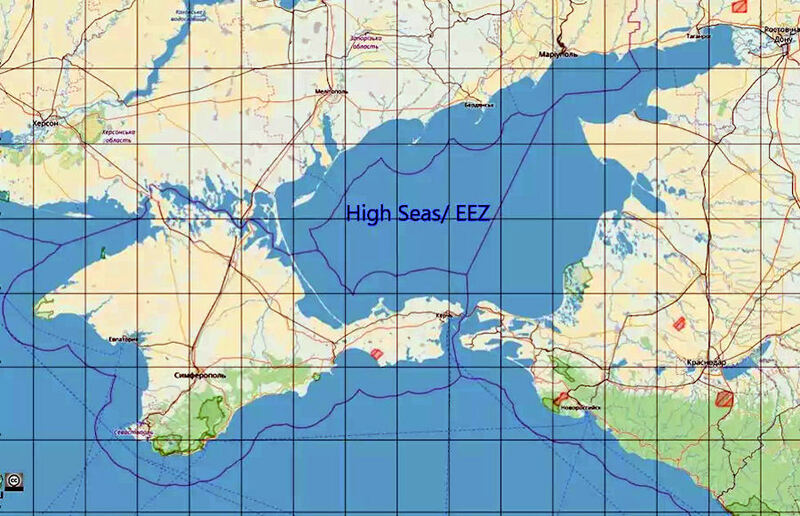 According to an FCO spokesperson, "Russia and its security forces continue to disrupt Ukrainian international shipping calling at Ukrainian ports in the Sea of Azov. 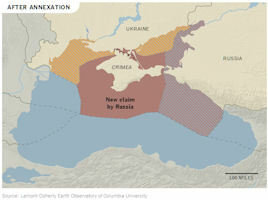 In March Russia opened an unlawfully constructed bridge across the Kerch Strait connecting Russia to the illegally annexed Crimean Peninsula." President Petro Poroshenko signed the law "On the adjoining area of ? ?Ukraine", adopted by the Verkhovna Rada on 06 December 2018. 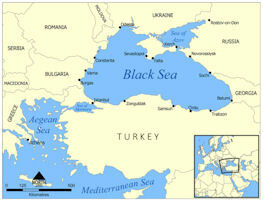 This law will double the zone of Ukrainian control in the Black Sea. 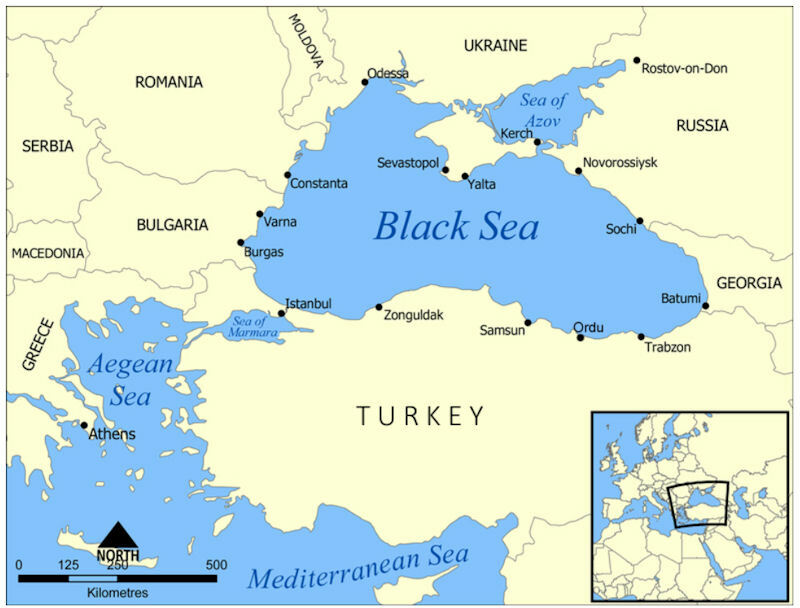 The purpose of the law is to "harmonize the maritime legislation" of Ukraine with the legislation of other Black Sea states and other states parties to the 1982 United Nations Convention on the Law of the Sea. The law is also aimed at preventing smuggling and illegal ship activities in closed ports of the occupied territories of Ukraine. 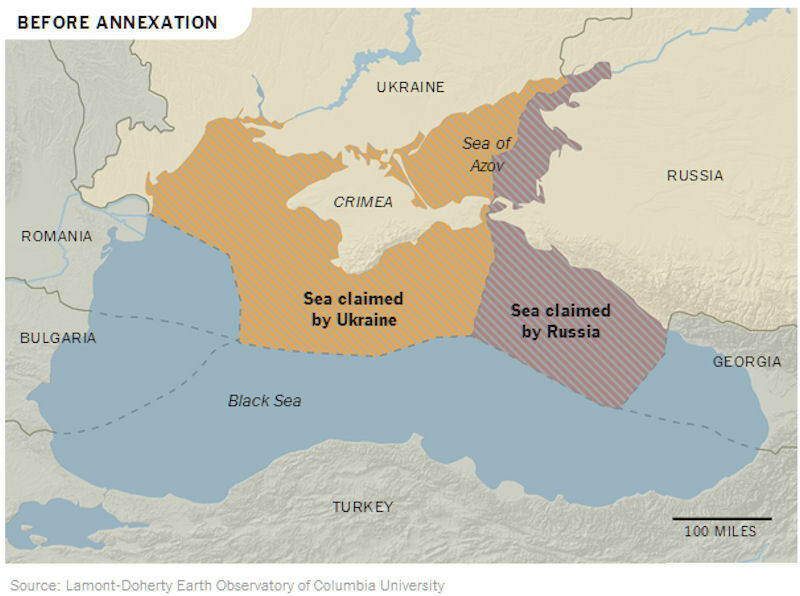 In accordance with the law, the adjacent zone of Ukraine is an open sea zone adjacent to the territorial sea of ? ?Ukraine and the external border of which is at a distance of not more than 24 nautical miles, measured from the outgoing lines, from which the width of the territorial sea of ? ?Ukraine is measured. "In its adjacent zone Ukraine carries out the control necessary to prevent violations of customs, fiscal (tax), immigration (migration), sanitary legislation of Ukraine within the territory of Ukraine, including its internal waters, or the territorial sea", - the statement reads. 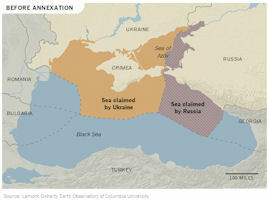 In accordance with the law, the authorized body, which guarantees the integrity of the state border and the protection of sovereign rights of Ukraine in its adjacent and exclusive (marine) economic zones, may stop vessels; inspect them; detain or arrest vessels and / or their crew members, except for warships and other state vessels used for non-commercial purposes. According to the law, if a vessel violates Ukrainian legislation and attempts to disappear, the authorized body has the right to "pursue such a ship in hot pursuit" in order to detain and bring to justice under the 1982 United Nations Convention on the Law of the Sea.